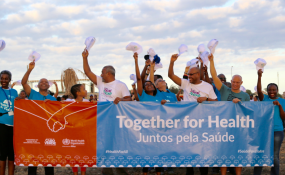 Praia — Led by the Cabo Verde's Minister of Sports and the World Health Organization (WHO) Regional Director for Africa, hundreds of people held hands and stood side by side in an umbrella shape on Quebra Canela beach in Praia to show their solidarity for universal health coverage. The flash mob was organized through word of mouth and social media and was the first in Africa of many similar global events leading up to World Health Day on 7 April, with the "solidarity chain" reflecting the 2019 themes of solidarity and equity. "A meeting with so many leaders in health service from Africa and beyond gathering in our country to work on new partnerships to achieve universal health coverage, is a perfect moment to reinforce our commitment to this ambitious goal," praised H.E. Dr Fernando Elísio Freire, Minister of State, Parliamentary Affairs, President of the Council of Ministers and Minister of Sports, referring to the second WHO Africa Health Forum that begins on 26 March. "Solidarity chains" are being formed around the world with WHO directors and staff joining hands with partners, patients, policy-makers, health workers and donors in a symbol of the commitment to bridge gaps and work collaboratively towards universal health coverage. "It is fitting that Cabo Verde was the first in Africa to show support for this global chain of symbolic support for our shared ambition to provide all people affordable access to health services because the country is leading on universal health coverage in Africa," said the World Health Organization Regional Director for Africa, Dr Matshidiso Moeti, who also joined in the chain. World Health Day 2019 marks the end of the celebration of the 70th anniversary of WHO and is at the midpoint between the 2018 Global Primary Health Conference in Astana and the High Level Meeting on Universal Health Care to be held at the United Nations General Assembly in New York in September 2019. This year's World Health Day will focus on equity and solidarity to promote health for all, everywhere, filling gaps in health services and leaving no one behind.